The PSL3000 system has a new LED engine with improved performance and reduced operating costs available as an easily installed wall-mount unit*. The PSL3000 system comprises just 2 key elements, the light engine/driver housing and the fibre. The system can be specified to emit green or blue light or a combination. 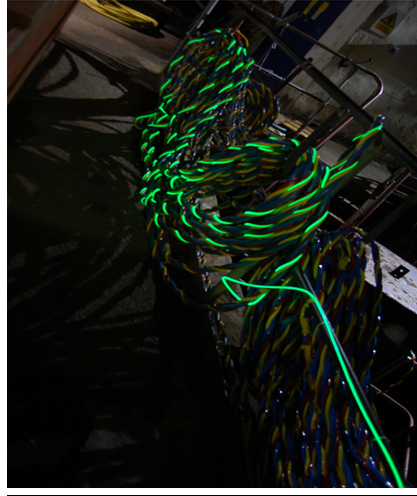 A single system will illuminate 100m of fibre either as 2 x 50m tails or as a single 100m loop. The preferred option is for a daisy chain approach with the system housings at a nominal 100m spacing. In both loop and daisy chain configuration there is inherent redundancy due to double injection. The system can be configured to suit specific customer requirements with options including mains power, battery power or battery back-up in the event of mains failure. In this mode the battery is trickle charged and the Lightpath will operate for in excess of 3 hrs, flashing along its complete length to indicate the unit is operating in battery mode due to mains failure. The system has the capability to be linked to a BMS (Building Management System) for central monitoring and/or control. The system configuration is designed for 24x7 all year operation, consumes <10W of electrical power making it one of the most cost effective forms of safety lighting in both power consumption and minimal maintenance.